President Trump today signed off on tariffs that the administration believes will help strengthen and improve the nation’s steel and aluminum industries. Here are some key figures relating to the production of those metals in the U.S., and where that ranks globally. How much steel is produced in the U.S. every year? The U.S. produced 81.6 million metric tons of steel in 2017, according to steel trade group The World Steel Association (WorldSteel). That marked a 4 percent increase from the year before when it produced 78.5 million metric tons in 2016, WorldSteel reported. Which state produces the most steel? Vice President Mike Pence’s home state of Indiana is the highest producer of steel in the U.S., according to the Indianapolis Star. How much steel does the United States import? According to a report released by the Commerce Department in February, the U.S. is the largest importer of steel. "On an average month, China produces nearly as much steel as the U.S. does in a year," the Commerce Department said in a summary of the report. In 2017, there were 36 million metric tons of steel imported to the U.S., and only 10.1 million metric tons of steel produced, according to the report. Which country produces the most steel? China is far and away the world leader in steel production. In 2017, China produced 49.2 percent of the world's steel, with 831.7 million metric tons, WorldSteel reported. 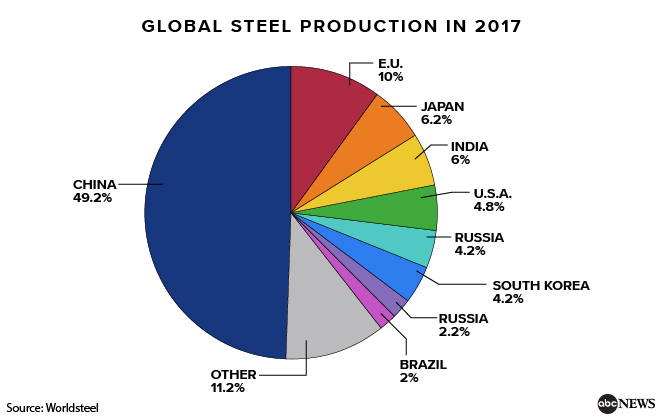 Japan is the second-leading producer, adding 6.2 percent of the world's steel to the marketplace, followed by India, which produces 6 percent, according to WorldSteel. The U.S. is ranked fourth. How many Americans work in steel production? According to the Council on Foreign Relations, there are roughly 140,000 people employed in the steel industry in the U.S. today. That is significantly lower than at its peak, in the 1950s, when CFR reports there were about 650,000 working in the industry. How much aluminum is produced in the U.S. every year? The U.S. produced 785,000 metric tons of liquid aluminum in 2017, according to the Commerce Department report on the topic. How much aluminum does the United States import? The U.S. imported 5,046,000 metric tons of aluminum in 2017 and exported 315,000 metric tons, according to the Commerce Department report. Which country produces the most aluminum? China leads the way here as well. According to a January 2017 report from the U.S. Geological Survey, China produced 31,000,000 tons of aluminum. That represented 53.5 percent of global production. The U.S. ranked ninth in aluminum production, according to data from that report. How many Americans work in aluminum production? According to trade group The Aluminum Association, the U.S. aluminum industry directly employs almost 161,000 workers.